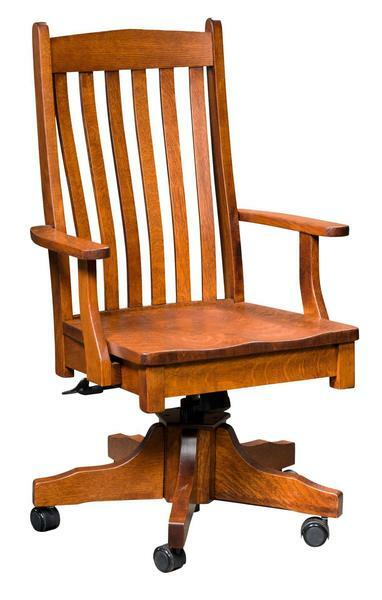 The richness of the wood will be one of the first things to draw your eye with the Amish Liberty Desk Chair with Gas Lift sitting behind your desk. Work from home in comfort or equip your office with this custom made solid wood desk chair. The Liberty is a mission style masterpiece, with graceful back slats, a shapely chair crown and a five point base. Move easily from computer to credenza with casters allowing your desk chair to glide. Just as important as the function, storage and style of your desk is the chair you will use to sit behind it. Browse our collection of Desk Chairs to see the variety we have to offer. The Liberty is shown here in quarter sawn white oak wood with Michael's cherry stain. Quarter sawn white oak wood is known for its amazing strength and firm texture. Overall Height (adjustable): 41 1/4" - 46 1/4"
Seat Height (adjustable): 20" - 25"
Arm Height (adjustable): 27" - 32"
Shown in Quarter Swan White Oak Wood with Michael's Cherry Stain.